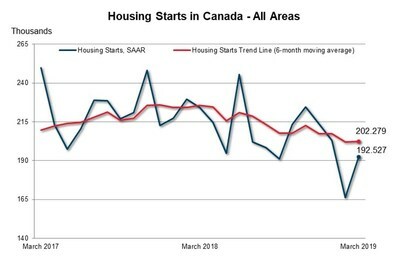 OTTAWA, April 8, 2019 /CNW/ - The trend in housing starts was 202,279 units in March 2019, compared to 202,039 units in February 2019, according to Canada Mortgage and Housing Corporation (CMHC). This trend measure is a six-month moving average of the monthly seasonally adjusted annual rates (SAAR) of housing starts. 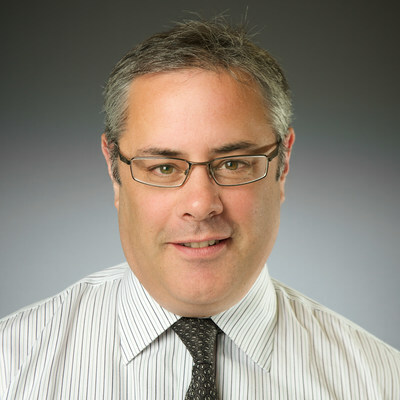 "The national trend in housing starts was essentially unchanged in March, remaining near its historical average," said Bob Dugan, CMHC's chief economist. "The trend has been very stable since the final quarter of 2018, following a period of steady declines from the historically elevated levels registered in recent years. Higher mortgage rates combined with still-favourable, but less stimulative economic conditions have contributed to moderation in demand for new homes in urban centres." Vancouver Census Metropolitan Area (CMA) housing starts trended higher in March, with multi-family projects getting underway in the City of Vancouver accounting for approximately half of the total for the month. Housing starts recorded in the first quarter were 16% below the total for the same quarter a year ago. While the pace of residential construction remains near its all-time high, slower resale market conditions have encouraged some developers to direct buyers to existing projects prior to starting new units. Housing starts in the Kelowna CMA declined in March, relative to the same month last year, across both the single-detached and multi-unit segments. However, in the first 3 months of 2019, housing starts were up significantly as a result of strong multi-unit housing starts, particularly a large number of apartment condo units getting underway. Overall, new construction activity continues to be supported by positive fundamentals such as growth in population, employment and income in the Kelowna area. A combination of soft demand and elevated inventory has prompted builders to continue slowing down production. The exception is row starts, which have increased year-over-year by 48% in the first quarter. As economic challenges persist, prospective buyers are seeking more affordable options in the market. Total housing starts trended lower in March after the pace of construction activity slowed in the singles and multiples sectors. Across all dwelling types, builders initiated 25% fewer housing units in the first quarter of 2019 than during the same time a year earlier. The largest reduction in homebuilding activity has been in multi-unit production, which was down 44% from one year prior. The Toronto CMA total housing starts trend rose in March as higher trending condominium apartment starts offset the decline in low-rise starts. Rising homeownership costs dampened pre-construction sales for low-rise homes in 2018. Conversely, condominium apartment pre-construction sales remained strong in the last two years given their relative affordability. As a result, condominium apartment starts continue to dominate Toronto CMA new housing construction in 2019. New home starts in the St. Catharines-Niagara CMA continued their upward trend in March to reach an 11-month high. Significant increases were seen in single-detached and townhome starts. Relatively affordable home prices in St. Catharines-Niagara continue to draw homebuyer demand from neighbouring regions. Just over 5,000 starts were enumerated in the Montréal CMA during the first quarter of 2019—a 10-year high. This brisk pace of activity was attributable to significant apartment construction, particularly in the rental housing segment, as the condominium segment registered a decrease. The low vacancy rates, aging of the population and greater proportion of young households now opting for the rental market continue to stimulate rental housing starts. In the first quarter of 2019, housing starts in the Gatineau (Québec part of the Ottawa-Gatineau CMA) area recorded a significant gain of 105% over the same period last year. This strong increase was attributable mainly to the rise in rental housing starts. The aging of the population and the low vacancy rate have continued to stimulate starts of this type in Gatineau. Total housing starts in Halifax continue to rapidly expand as construction on the multiples market recorded one of the strongest first quarters on record. Although the number of rental apartment units currently under construction is at a historical high, steady rental demand has pushed year-to-date multiples starts to increase by 143% compared to quarter one of 2018. CMHC uses the trend measure as a complement to the monthly SAAR of housing starts to account for considerable swings in monthly estimates and obtain a more complete picture of Canada's housing market. In some situations, analyzing only SAAR data can be misleading, as they are largely driven by the multi-unit segment of the market which can vary significantly from one month to the next. The standalone monthly SAAR of housing starts for all areas in Canada was 192,527 units in March, up 15.8% from 166,290 units in February. The SAAR of urban starts increased by 17.0% in March to 178,033 units. Multiple urban starts increased by 18.6% to 135,894 units in March while single-detached urban starts increased by 12.1% to 42,139 units.